Pink Peace Signs and Hearts Rule this bow. The base bow is a brilliant white 1.5" grosgrain ribbon, with 2 layers of criss-crossed 3/8" satin ribbon that says "PEACE" in white and then there is a lime green peace sign. 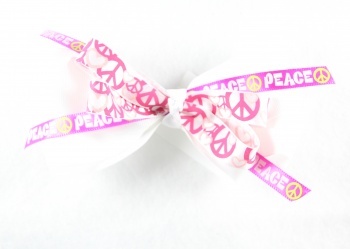 The top layered bow is a white 5/8" satin ribbon that has pink peace signs and hearts all over it. Wrapped in the center with white grosgrain ribbon into a French knot and on a 2" French clip.